Bhetala - Who is qualified as father? Once upon a time, a trader named Pravardhamana lived in Dhaaranagaram. He was a successful man in business and was one among the richest persons in the kingdom. He had a beautiful daughter who had attained the age to perform marriage. When the trader was thinking how to go about his daughter's marriage, one night dacoits barged into his house and decamped looting all his belongings and killing him. After loosing her husband, Pravardhamana's wife took off to a journey with her daughter Jayaprada not knowing where to go and what to do. They left Dharanagaram and were passing through a jungle in the dark. While they were walking in the dense forest, as it was shady they mistakenly stamped a thief's leg. The thief was already severely wounded and was on the verge of death. Oh God! screamed the thief with pain. Meanwhile, clouds cleared in the sky spreading moonlight on the jungle. In the dim light, they noticed him and were sorry for his state. Falling pity on him they stood close to him. The thief indicated to the bottom of a tree nearby and said varahas were buried near the roots. The duo went there and took the money out of the ditch. Immediately mother went to the pond close to the place and brought some water and performed her daughter's marriage with the thief. After a while the thief died and the women reached a town crossing through the forest and started living in a rented house. As the days were passing by, Jayaprada loved one Brahmananda Sastry who was passing through their street regularly. She informed her mother about Sastry and wished that she was inclined to flirt with him. The next day, mother invited Sastry to their house and conveyed that her daughter was interested in him. Sastry was happy to spend some time with Jayaprada and demanded some money for the act. Mother agreed and paid the sum to Sastry. As a result of the association of Sastry, Jayaprada was pregnant. Few days later, Sastry lost interest in Jayaprada and stopped visiting her. Jayaprada gave birth to a baby boy. The same night Jayaprada dreamt of a Goddess ordering her, This boy will become a king. Take him on the cot to the portal of the royal palace and leave him there placing one thousand varahas beside him. She woke up mother and detailed the entire dream. Immediately both prayed the Goddess and decided to go by her order in the dream of Jayaprada. They made all the arrangements according to the Goddess and left the child in front of the royal palace. Meanwhile, the Deity appeared in the dream of the king Kamaladitya and said, King! You are not blessed with children. One child is lying on a cot with one thousand varahas beside him in front of your palace main gate. Go, get him and groom him as your own son. The king woke and rushed to the main entrance of the palace. He found the child as per the dream and took him into the palace and handed him over to his queen. Time passed by and the child grew. He was named Vimaladitya. Years cut through and the kind died after crowning Vimaladitya as his successor. Vimaladitya seeking better place for his father in the heaven went to holy town Kasi and was about to leave food to the dead. 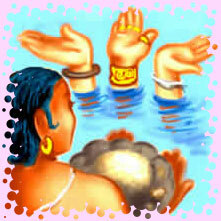 Suddenly, three hands rose from the water and Vimaladitya was confused in which hand he should place the food. He sought advice from Brahmins. The Brahmins looked closely at the hands. They decided that one hand belonged to the King, depending on the ornaments, the other one belonging to a Brahmin and the third one as thief's. Bhethala questioned the King Vikramaditya, you have heard all the story Vikramaditya! Now, tell me whom should Vimaladitya offer the celestial food. Vikramaditya smiled and replied, Bhethala! there is no doubt here that who is a qualified father. The king groomed the child taking one thousand varahas, hence he could not be graded as father. When it comes to the Brahmin who was directly responsible for Vimaladitya's birth, he took money for associating with Jayaprada. Therefore Brahmin is also not qualified as father. Comes the issue of the thief, he married Jayaprada paying money and said that anytime a son is born to her he would be treated as his son. So, it is the thief's hand on which Vimaladitya should place the sacred offering.